If you have lost an animal, there are a number of steps that you can take to help find the animal and bring it back home. 2. Call your local municipality. Some municipalities keep lost and found records, while some hold stray animals for up to 48 hours until transferring them to the local animal shelter. 3. Put out food and water. Some animals will return home, back to the source where they know that they can find food, water and shelter. Putting out food and water may help lure them back home quicker. If your pet has a special bed or blanket, you can place this out as well and hopefully draw them back home with the familiar scent. 4. Make posters and flyers. Be sure to include important information on these flyers such as your contact information and the date and location where your pet went missing. Be sure to include as many distinguishing features about your pet as possible, including breed, age, color, etc. Hang these posters in public areas, such as in pet stores or on telephone poles. Sharing these posters on your social media accounts is also an effective way to spread the word about your lost pet. 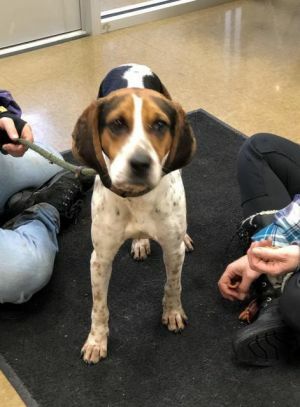 Most shelters, including the Humane Society of Lebanon County, allow flyers to be posted on their social media accounts alerting everyone to a lost animal. 5. Tell your neighbors. Having an extra set of eyes on the lookout for your pet is always helpful! If you have found a stray animal, there are a number of steps that you can take to try and reunite the animal with their owner. 1. Call your local animal shelters. Most animal shelters keep lost and found reports. If you call in having found a stray animal, give the shelter as detailed a description as possible. Then they can hopefully match up that animal with any similar lost reports that they may have and return the pet to its owner. Most shelters, including the Humane Society of Lebanon County, scan all stray animals for microchips. If the animals is microchipped and if the microchip is registered, the shelter can then return he animal to its owner. If you’re planning on bringing an animal into an animal shelter, be sure to do two things. First, always call ahead before bringing in the stray animal. Some shelters have limited capacities, and it is always courteous to call ahead first to ensure that there is an open available cage. The shelter staff will also be able to inform you if there are any fees that they charge for bringing strays into their shelter. Second, if you are going to bring a stray into an animal shelter, be sure to go to the shelter located in your county. Most shelters do not accept strays outside of the county lines. 2. Call your local municipality. Some municipalities keep lost and found reports, and may be able to connect you with the owner if a matching lost report has already been filed. They also will be able to inform you of possible shelters and rescues where you can take the animal. 3. Take the animal to your local veterinarian. Most veterinarians have equipment enabling them to scan for microchips. If the stray animal is microchipped and if the microchip is registered, then the veterinarian will be able to tell you the animal’s owner and home address. 4. Make flyers and posters. Making up posters and flyers for found animals and hanging them up in high traffic areas is one way to hopefully get the owner’s attention. Make sure to include important details such as your contact info, the location the animal was found, and as many distinguishing features of the animal as possible, including breed, gender, age, etc. Posting these flyers on social media accounts is likewise very effective. Most animal shelters, like the Humane Society of Lebanon County, allow flyers posted on their Facebook page. At the time of reclaiming a dog the owner must purchase a dog license.